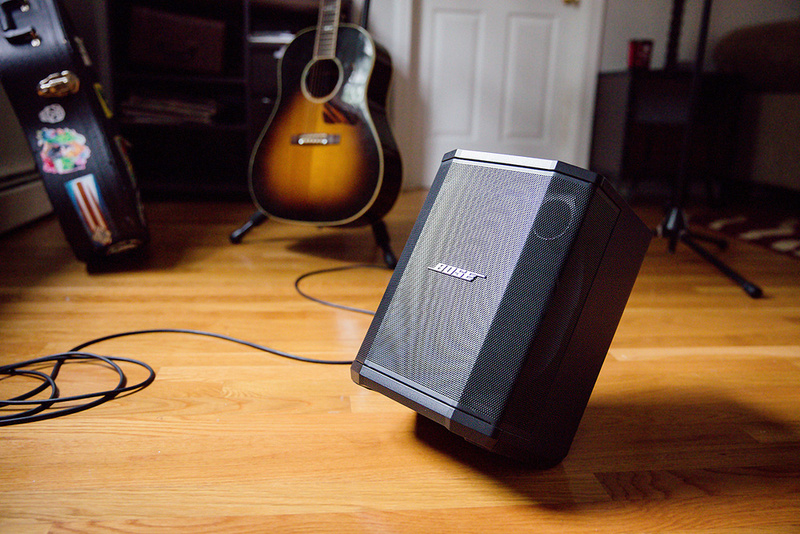 Bose’s new all‑in‑one PA might be small, but it packs some serious punch. It’s always good to try something new, and though there is a reasonable choice of portable, all‑in‑one sound reinforcement systems on the market, there aren’t many that claim to be as portable or as versatile as this latest offering from one of the longest‑established names in the industry. Continuing to develop their interesting story from the day when Amar Bose began repairing radio sets all those years ago, Bose do certainly have form when it comes to innovation (think noise‑cancelling headphones, for instance, or the L1 speaker system), and they seem to be continually striving to bring us new ideas. The S1 Pro is marketed as a ‘multi‑position PA system’, and in my view it takes the whole idea of portability to a new level. It is a very compact piece of gear and certainly smaller than some studio monitors out there; stood upright it’s a mere 330mm or 13 inches tall, and at only 241mm (9.5 inches) wide it makes an extremely low‑profile ‘landscape’ monitor, even allowing for the wedge angle. The ‘multi‑position’ tag alludes to the fact that an internal sensor detects the orientation of the enclosure and applies automatic compensation to the EQ, optimising it for the position in which it’s being used, and enhancing its go‑anywhere appeal. When I first unboxed the S1 Pro I was surprised at how small it really looked, and I have to admit to wondering how much sound could actually come out of such a tiny speaker calling itself a ‘PA’, even if it did have a Bose logo on the front. So, instead of reading the manual, or installing the battery, or checking out the Bluetooth connectivity and so on, I just stood it on the floor and put some music through it — and I have to tell you that the sound level this little speaker can produce is both surprising and impressive, and there’s no lack of bottom end either! As with most self‑powered speakers, you can get a good idea of the basic functionality by looking at the control panel. The S1 Pro has a three‑channel mixer with two identical inputs for microphone or line‑level sources, and a third channel for line‑only (via a mini jack) or Bluetooth input. Straight away you’re thinking ‘singer‑songwriter with guitar and maybe backing track’, and I’m sure this is where a lot of the S1 appeal will find favour, but its audio capability and flexible placement options will also open up uses as a discreet floor monitor, engineer wedge, or as a compact main PA, especially if used as a pair. 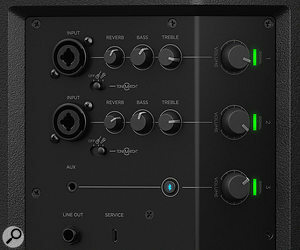 The S1 features a built‑in three‑channel mixer, with two mic/line inputs and one line input that can also accept a Bluetooth source.The first two input channels are provided with combination XLR/jack connectors that will take a balanced or unbalanced feed, and the channel level control has an associated LED that shows green for signal present and red for signal clipping. 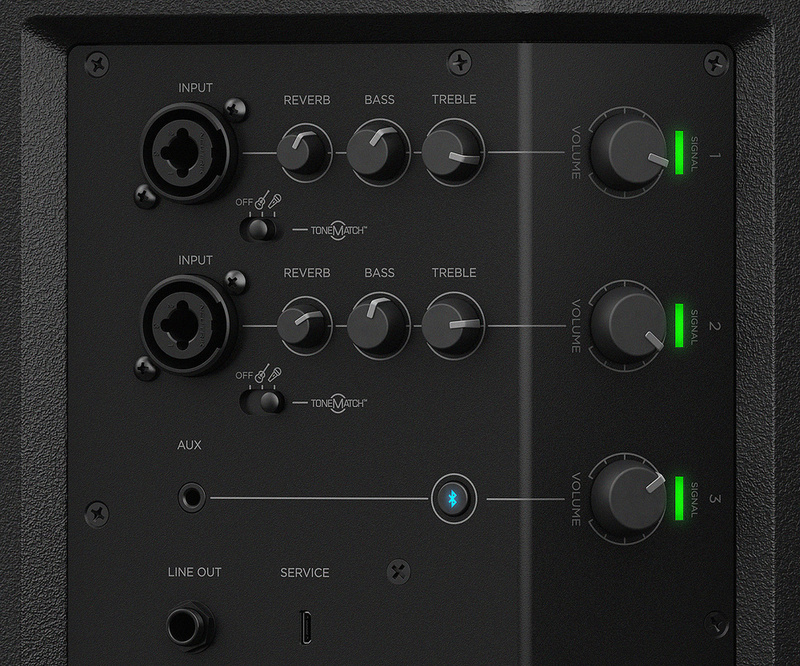 The EQ is basic but effective enough, with just two controls — fixed treble and bass — and there is a small slide switch for recalling a ToneMatch preset for guitar or voice. The presets are a good way to start setting up the S1 Pro in any given space, and are intended to be used when connecting a mic or instrument directly to the S1 mixer inputs, rather than when using it as a PA speaker fed from an external mixer. There’s an on‑board reverb processor available to channels 1 and 2, and this has one simple level control for each input. It works nicely and would be useful in adding a bit of character in a very dry venue. The third mixer channel has a 3.5mm stereo jack input and a level control (and LED) only; no EQ is provided so this has to be adjusted on whatever external device is connected. This channel also serves as the Bluetooth input, and there’s a pairing button for establishing connection with the source device. Once connected this proved very stable, and it is a very convenient feature — anything that does away with cables (and works properly) is good for me. One application where this feature came in very handy was at a school performance, where the student’s music teacher was able to cue and run backing tracks using a mobile device from an off‑stage position, leaving the student free to concentrate on their live performance. Finally, there’s a line output on standard TRS jack for taking the post‑mixer output to another system. If you take a look at the outside of the S1 Pro enclosure you can see why they call it ‘multi‑position’: there are various angled surfaces that enable it to be positioned in a variety of attitudes. One of the more unusual positions is an upright (ie. portrait) mode, but tilted back to aim upwards at either a close‑in audience or at the performer — this uses one of the cabinet surfaces and doesn’t need any extra feet or stand hardware. I found this position to work very well when I used it as a keyboard monitor in an orchestra pit, and was able to aim the sound right where it was needed. There is a standard 35mm speaker stand/pole socket on the base of the S1 Pro, so getting enough height on the unit won’t be a problem. Lithium battery technology has developed rapidly over the last few years, and the Bose S1 Pro makes good use of this by including a battery‑power option. The battery needs to be installed as it is generally shipped separately (there are various regulations covering this in different countries), but this is a very quick and easy process and only requires undoing two screws on the bottom of the unit to remove a metal plate. Making sure the battery pack is the right way around (by looking at the connector pins), you just push it into place and re‑fix the cover plate, and you’re good to go. When the S1 Pro is plugged into the mains supply the battery will automatically charge at the proper rate, and it is perfectly OK to leave it plugged in. Should you need it, there is a Quick Charge mode, engaged by moving the power switch towards the little battery icon. Obsessive folk like me wouldn’t dream of leaving home unless the S1 were fully charged, so thankfully the battery status is easily checked: when the S1 Pro is switched on the power LED indicator will flash a number of times to indicate the charge status, or you can press the Bluetooth pairing button twice to see the same indication if the unit is already on and you don’t want to power‑cycle it. If battery level is below 10 percent, the power indicator lights red, otherwise it’s blue, and four flashes means you have over 75 percent in the tank. Bose’s manual says that the battery will provide up to 11 hours of operation, and requires a minimum of three hours for a full charge using the Quick Charge option (you can’t use the S1 while it’s fast‑charging). I wasn’t able to run the unit for anywhere near this long (I didn’t have time), but I did use it for a good 3‑4 hours without any recharge, and that really ought to be enough to cover most situations! I used the S1 Pro for a couple of outdoor events, one for music and one for announcements, and used it on battery power the whole time with no issues whatsoever. At one event in particular it was especially good not to have to fight for the nearest power outlet, and the refreshment people could keep their kettle plugged in all day. Smiles all round. I used the S1 Pro in a few rehearsals, both as a vocal floor monitor and as a keyboard amp, and it had no difficulty keeping up with my 16‑piece band. (If I’d had a second unit I would have liked to try rigging them as a small PA system on stands, as a single speaker wasn’t right for the space.) The versatility of the S1 Pro is enhanced by the smart auto‑EQ trickery I mentioned earlier, although it’s quite subtle and the overall system output can be helped by where the S1 is positioned. It’s worth experimenting with placement to achieve the best results in any given performance space, and especially if playing in a new venue. I must have used the S1 Pro in just about every way over a couple of weeks, and whether it was on a pole, a table or on the floor it was always possible to get a good, clear sound balance. The published frequency response of 62Hz‑17kHz doesn’t seem hyped or marginal in any way, the horizontal HF coverage is very wide, at 120 degrees, and it has a way — a bit like those miniature vertical arrays — of seeming to fill the room with sound and achieving a good tonal balance across the audience area. It is a very compact speaker, so it’s obviously not going to produce chest‑pounding mid‑range at 50 meters on grass, nor is it something your heavy rock frontman is going to want to rest his foot on, but the output levels it can achieve whilst maintaining a very good sound balance and quality are truly surprising for such a small box. Aesthetics have always been part of the Bose tradition, and the S1 Pro is indeed a good‑looking speaker and would look right at home in any classy piano bar. The Bose badge on the front grille can even be rotated through 90 degrees, and the must‑have fashion accessory has to be the neat little slip‑on travel cover that simply drops over the top and still allows access to the large integrated handle on the top surface. There is more information on the Bose website, and there is a free app available for iOS and Android that can be used to access some additional functionality, including a stereo mode for connecting to a second speaker. The S1 Pro can have its firmware updated via a micro USB port on the control panel, and the thought of future updates just adds to its appeal. At a current street price around $599, including the battery pack, it’s not a giveaway but it is true Bose design and quality, and I can’t imagine anyone owning one of these and not using it on every single gig — even if you didn’t need it you’d surely take it anyway! Using the Bose S1 Pro has been a delight. It’s small, it’s light, and it’s loud! This diminutive powered speaker has proved its usefulness and delivered great results in a number of applications, and the internal battery power has been much appreciated whenever I get to the part where I have to find a mains source and run cables. The S1 is light enough and small enough to be taken along just about anywhere, and produces a way‑beyond‑expectation level of good‑quality output for its ultra‑compact size. About the only downside I can think of is that it might appear rather too attractive and easy to ‘move’, so I’d want to keep a watchful eye on it! You might also want to look at the dB Technologies Ready 4, or LD Systems’ Road Buddy 10. Extremely compact and very light. Full sound with no lack of low-end output. With the battery installed it truly is a portable PA speaker. It’s too small and cute to say anything bad about! The S1 Pro is compact, portable, has a number of thoughtful features and — above all — sounds great. What’s not to like?